This is all generally stated, and will differ depending on where you live, but in general this is what you will/will not find in a German house. The most noticeable thing I found when looking at potential places to live was the lack of storage. In Germany there aren’t closets, not in the bedrooms, not in the hallways, and there isn’t any under the sink storage or any cabinets in the bathrooms either. You have to purchase your storage or build a closet if you want somewhere to put your stuff. We easily spent over $2000 on furniture storage when we moved here. This can be frustrating if you’re used to your hallway closets, linen closets, walk-in closets…you get the idea. On the flip side, your home is like a clean slate that you can modify however you like. 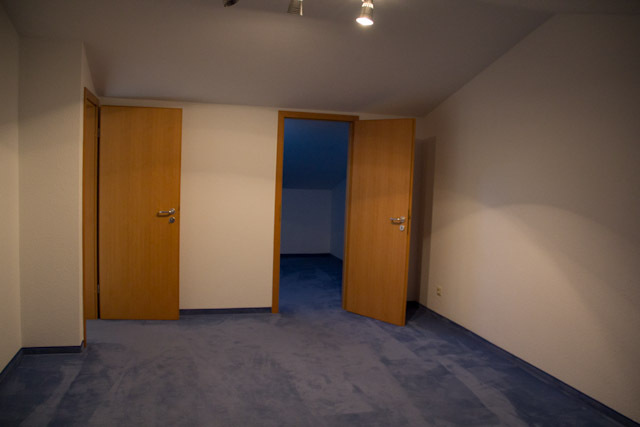 In the same regard, many German homes do not come with kitchens or light fixtures. We had a kitchen, but had to put in our own lights. otice in the photo below there is no place to store our stuff. The cabinet on the right we bought from IKEA and it eventually went under the sink so we could have some storage. Most German homes are built of concrete. This is something I absolutely LOVE about our German home and is especially the case in the summer. I realized why Germans don’t have A/C, it’s because it's not necessary in most places. Our house stays very cool in the summer due in large part to the thick concrete walls separating us and the hot ball of fire in the sky. It also stays pretty quiet inside our house; even with the planes flying almost overhead (we live by the airport). The windows in Germany operate much differently than in the states. This is a bit of an adjustment but is another thing I really like about our German home. The windows are thick and sturdy. They have three different functions: fully closed, can open up completely like a door, or when the handle is flipped up the top of the window opens to let air in (at a slant). The windows don’t slide open like most in the U.S. I love this because it allows for a good draft of air to get in. I remember before we left the states I was worried about the strangest things, one of which was the fact that none of the windows have screens to keep the bugs out. I imagined them easily finding their way into our home. Well with how the windows operate that’s not an issue. See those huge things popping out of our walls in the photo below? Those are our radiators. The house we're renting isn't an old place, built maybe 10-15 years ago, so it amazes me that they still used these eye sores for their heating. Another popular and much more attractive heating method is in floor heating. The upside to having the radiators is that you can choose which rooms you want to have heated. This is great for us since I love sleeping in sub-zero temperatures at night (and thankfully my husband does too!). I always open the windows in the dead of winter so I can sleep better. Another reason why that isn’t an issue is because German windows have shutters. No, not the American style ones. The shutters, also called rolladens – are metal and slide up and down vertically to cover the window. They’re on the outside of the house and are operated either manually or automatically. The new homes have really nice automated rolladens that adjust and move up and down depending on where the sun is and the strength of the sun. They do this to maintain the optimum temperature in the home. How nice is that? If only Americans adopted some of these things to save on summer energy costs as well as help the environment. The washers and dryers are much different in Germany! You actually need to read the manual to figure out how to use it. The most noticeable difference is that they’re smaller, but on closer inspection you’ll see that some of the dryers do not have a hose attachment or anything similar. For these dryers the water is removed from your clothing and put in a large container that you must empty after each time you use the dryer. Luckily for us we have a sink next to our dryer. There are also two areas to remove the lint. There are other dryers that do operate similarly to the ones you find in the states. Our washer has about 25 different settings to choose from to wash your clothes. I still have no idea what 99% of them do. I’m not even sure I know what the one dial I use every time does. All I know is that I choose the setting with the shortest time to wash, which by the way is two hours! Did I mention that laundry day really takes at least a full day in Germany? Kitchens are often smaller in Germany, and everything inside the kitchen is smaller as well! In our kitchen the sinks are smaller, the dishwasher is smaller, if you’re lucky enough to have a freezer it will be much smaller too. The pantry is small (again, if there is one) and the oven is small too. The most obvious difference from American kitchens is that the appliances are much smaller. I had to put many of our baking sheets in the basement because they were too big for our oven. When we first moved here this was a big culture shock, but after living here for a year and a half I realized that I really do not need a bigger kitchen, especially with just the two of us. There are times when we have friends over that I wish our galley style kitchen was just a bit larger to accommodate more people, but in general I’ve found I prefer it. Anything that does not require much cleanup is a winner in my book. Even our smaller fridge and freezer works for us (although we do have a designated beer fridge which gets the overflow of food when we buy too much at the store). When we lived in the states we never filled up our refrigerator. We eat pretty clean so most of the time whatever is in our fridge is only going to last a few days anyway. This is especially true for Germany, the food is amazingly fresh! In Germany you'll also need multiple trash bins to separate your trash. 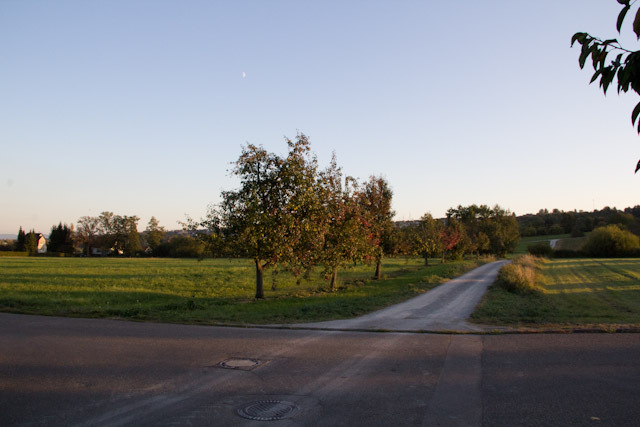 Germany is a very green country and as such takes care of their environment. I love this about Germany, and am glad that recycling is mandatory. However, this is sometimes frustrating trying to figure it out in another language. Even now I have items that I am not sure of – does it belong in the plastics bin, the regular trash, or is it paper? That seems easy, but what about a cardboard box with colors and writing on it? It may not be paper. On the right the two cupboards at the front of the photo are our fridge and freezer. The long cupboard is our pantry. It slides out and has shelves. his is German efficiency at it's finest. Every room has a door and I mean every room. When you walk into our house you basically walk into a room and have to open another door to get to the main part of the house. The kitchen has a door to section it off. A lot of the reason for this is to conserve energy. When you open the front door heat escapes and that is bad. This also ties into having the radiators in every room. Each room could have it's own temperature with all these doors! For the kitchen I had a friend tell me that that's to keep the smells in the kitchen and prevent your furniture and other items in the house from smelling like whatever it is your cooking. I thought smelling up the house with enticing aromas was part of the fun of cooking, but I do see their point! Luckily the doors are very easy to remove. They're merely sit on top of the hinges so you just lift the door and off it goes! We've taken off many doors in our house! Quiet hours apply inside your home as well as outside your home. For us this means no use of the lawn mower on Sundays. For other people they can’t do laundry or vacuum on a Sunday either. Basically anything that is really loud is prohibited. I don’t know if there is a law about what exactly isn’t allowed, but you’ll at least get a neighbor pounding on your door if you violate the noise laws. In most American houses there are vents that run throughout the home to filter and circulate the air. The bathrooms have vents as well. In Germany, however, there aren’t any vents. This came as a surprise for me when we moved here. I just assumed all homes had vents. 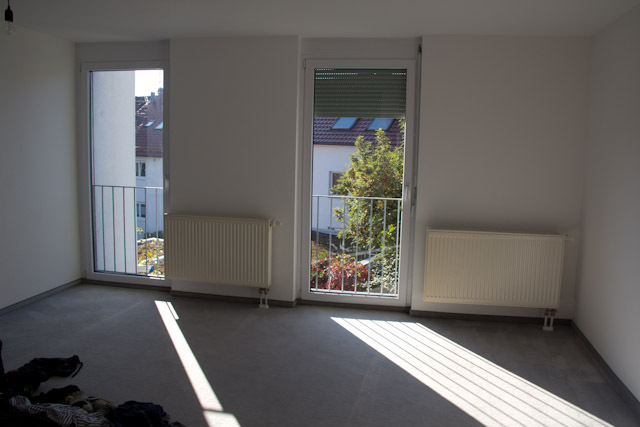 In Germany, the way to ventilate your home is to open a window and let the fresh air in – even in the winter. I love a nice cold breeze so this hasn’t been a problem for me. I also prefer the fresh air over the stuffy ventilated rooms. While sadly we do not have one in our house, many German houses have a sauna in their basement. I am jealous of these people. Everyone I know seems to have the same stairs as us; a spiral staircase that is airy (or isn't good if you have a puppy or small animal!). I think this is to save space but I think it's funny how most homes share soo many of the same features. I wonder if people think that when they go to the states?